Aadhaar card is a life long unique identity and enrollment is free of cost and it is not mandatory for citizens to obtain Aadhaar. It is a common mans rights. 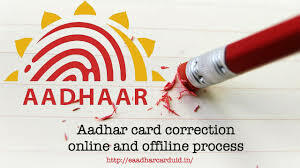 Citizens have the facility to change details in Aadhaar card. Citizens can modify/ change any mistakes in personal details, residence address online. If citizens have mobile number they can update their profile using this portal. Mobile No# is mandatory to receive password for login. Citizens can update name, gender, date of birth, address or mobile number registered in Aadhaar by following below online and offline methods. Citizens can submit the required documents depending on the field to be updated, attach original scanned copies of supporting documents as per Valid Documents List. Apply Online for Modification/ change in Aadhaar card through the below URL. Citizens can send updated Aadhaar Data Update/ Correction Form offline for correction of Aadhaar details through Post. Citizens seeking to change in residence address in Aadhaar card can submit Annexure duly attested by MP/ MLA/ Gazetted Officer along with Update Form. Address for sending Aadhaar Update/Correction request by Post at the below Address. Citizens already updated your Aadhaar details for correction/ modification can check Update Status. This is really a very nice post about the Adhara card. Its really nice that the best essay writing services provide these type of information to all of us. We can know about these things.